On July 2 a San Diego County Superior Court Judge, John Meyer, ruled that the teaching of yoga was not religious indoctrination as taught in the yoga programs in Encinitas, California schools. As a result, the Encinitas schools can continue to teach yoga to its students. The ruling is the result of a lawsuit was filed on behalf of the parents of two children attending Encinitas schools. The suit maintained that the teaching of yoga in the Encinitas schools violated a provision of state law outlawing religious teachings in public schools. The question of whether yoga teaches a particular religious agenda has been raised before, mainly by various Christian denominations objecting especially to chanting and meditation, which they perceive as advancing Hinduism. In his book Religiousness in Yoga, TKV Desikachar takes up the question of yoga and religion. Although yoga has its source in Indian thought, it neither dictates that a Hindu must practice it nor that a non-Hindu is prohibited from such practice. Yoga is universal in that it is the means to attain a desired new condition. If we want to be happier and we find the means to that happiness, that is yoga. Yoga is one of six darsana or schools of thought offering ways of seeing and knowing our selves more deeply. It is rooted in the Vedas, an ancient record of Indian culture. The Yoga Sutra, as the most important work on yoga teachings, is about the mind and how we may come to a calmer, more focused mind. To do this we might have already a belief in a Higher Power, but it is not required. Or if we find as our mind becomes more peaceful that we want to use that peacefulness to draw closer to a Higher Power, we may choose to do that. However a person perceives that Higher Power is up to each individual. 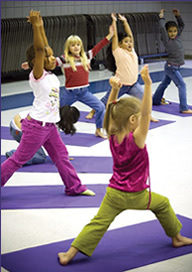 The LA Times reported the Superintendent of Encinitas schools saw the yoga program as “worthwhile in teaching healthy exercise and eating habits,” and “he hopes that teaching yoga to students will decrease instances of fight and bullying.” For those of us who practice yoga, we can cheer on this program, knowing from our own experience the change that is possible. If you have any thoughts on this case or Judge Meyer’s thoughts on yoga, please leave a comment. For many years, I have benefitted from yoga. It increases flexibility, balance and overall peace of mind. My grandchildren love doing yoga with me.